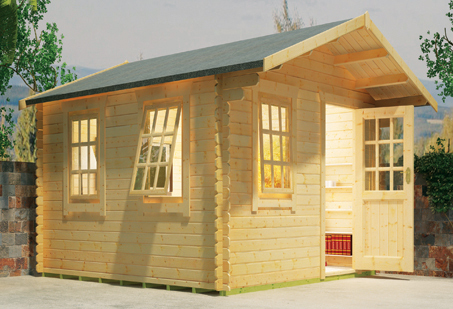 Superior Grade 28mm or 44mm Interlocking Logs The building is supplied with 2 opening windows. } Roof boards are 19mm planed tongue and grooved boards supported on 45mm x 120mm purlings. Doors and windows are joiner made and supplied fully glazed. Factory fitted pressure treated weatherproof heavy duty floor joists. Key-lockable opening windows and all doors and windows are professionally draft sealed. Heavy duty green mineral roofing felt as standard. Easy fit moular floor for fast and simple assembly.